The Ronin-M is only 2,3 kg and more lightweight then the big Ronin. The Ronin-M is perfect for cameras with a total weight of 3,6 kg! Compact, lightweight, and remarkably easy to use, the Ronin-M gives you what every filmmaker dreams of: freedom. 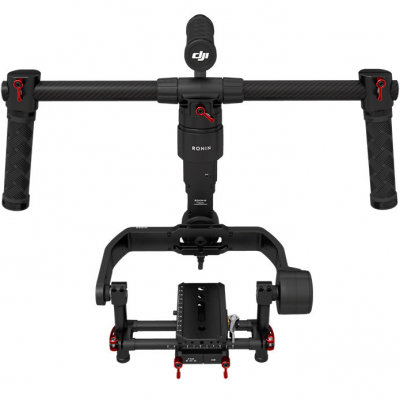 Featuring all of the functions of the original Ronin, but re-engineered for increased functionality and to be a fraction of the size and weight, the Ronin-M gives you the power of a professional setup in the unmatched flexibility of a one-man crew. Film all day, until you get every shot, with the Ronin-M’s smart battery and a runtime of over 6 hours. Overcharge and over depletion protection is built in, as is individual cell charge balancing. Remaining power is shown by clear LEDs and in the Assistant mobile app. Designed with high performance in mind, the Ronin-M’s brushless motors are incredibly precise and powerful while maintaining low vibration and increasing torque. Industry-leading accuracy is increased even further with Digital Absolute Positioning Encoders in each axis, and a much larger range of controllable motion on both the tilt (105° Up, 165° Down) and roll (± 110°) axes. The pictured camera is not included!